Five days in and I'm calling an audible. I found a couple lists of questions that other people have used in their own 30 day blog challenges. I have to use them as guidelines otherwise I will wind up talking about Zen in every post. I'm currently reading Reb Anderson's Being Upright: Zen Meditation and the Bodhisattva Precepts and binge-listening to Domyo Burk's The Zen Studies Podcast. I got Zen on the brain! 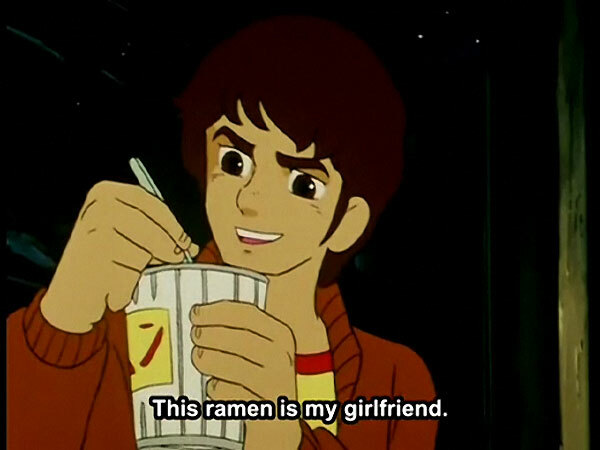 I am in a relationship with spicy ramen and it is getting pretty serious. Day 2: Where You'd Like To Be In 10 Years? The exact "where" is not all that important. I'm really hoping in ten years I can make my living by working from home. I hope to have a little plot of land where I can farm ramen with my ramen-wife. I'm not planning on ramen-children though. People who talk to you when you are clearly reading. Damn! Right into the minefield! I already touched on this a bit on Day 2. I'm fascinated by religion. If I was independently wealthy I would love to get a degree in Religious Studies. This is a hodgepodge of my thoughts on religion. Religions come into being and evolve out of our weird need for ritual and community. They grant purpose and meaning. Religion also allows another way people feel that they are right and other people are wrong. I respect everyone's right to believe what they want to as long as it doesn't cause harm to others. I adhere to the right to respect the believer but not the belief itself. I do my best to keep the two separate. I am very skeptical about supernatural claims and people who purport to know if there is an afterlife and what it is like. That's all I really want to say about that right now. Day 5: What Are Your Favorite Comfort Foods? And Why? Ok, not JUST Ramen. Burritos and loaded fries are also my favorite comfort foods. At one point I would have said nachos were one of my favorite comfort foods but I will now go for loaded fries over nachos any day. As far as the "why" of liking them...why does anyone like any food? It tastes good and makes me feel better (if only for a bit) after eating it. Ok, that is more than enough for today. I'm going to keep trying to post in the morning but I make no promises. Happy Friday the 13th! I am guilty of 3 and 5 on your pet peeves list. 3 is becoming less of an issue because my car will follow at a set distance from the car ahead (and vary the distance based on speed).